If you fancy a sugar hangover, look no further. This fudge is mouth-suckingly sweet and all the better for it. 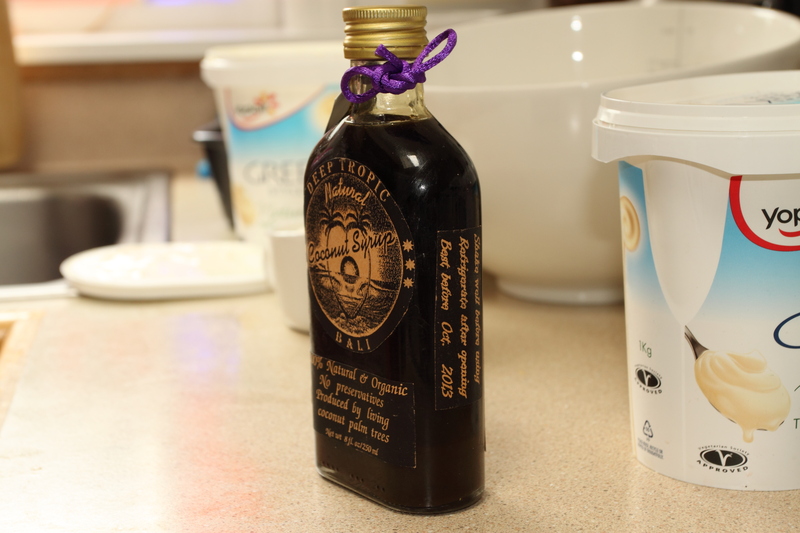 A firm Kiwi favourite, it is dense and rich, comprised largely of sugar, sweetened condensed milk and golden syrup. I can’t get to the bottom of its name. In my travels through the internet, I was delighted to find Nigella acknowledges we call Russian Fudge in our little country, although she calls her version Vanilla Fudge. This lovely Polish-authored food blog includes a recipe for Polish krówki, which translates as ‘little cows’ (how I love that!). Krówki is a sweet fudge very similar to our Russian fudge, and apparently Russia have a version too. New Zealand has a strong Polish connection, most famously through our post-World War II Polish refugee children. Could this explain it? I won’t keep you all waiting while I trawl through the history of New Zealand confectionary in hope of an answer. Here is my preferred recipe for Russian fudge. The best tip I can give you is beat the fudge for as long as it takes in the final stage – it really is important for making it set. Place everything except for the vanilla essence into a pot and bring to the boil, stirring constantly. Once it is boiling, keep stirring and let it boil for about 20 minutes, until a blob of fudge dropped in cold water can be formed into a squishy little ball. Spread into a baking tin and leave to set for at least two hours. You can tell the state of the economy by the price of a lime, or so the saying goes. What it’s meant to tell you, I’m not sure, but I can reliably inform you that limes in these here parts cost a small fortune at the moment. This is why I can never resist the bags of juicy, home-grown limes which perch temptingly by the counter for only five dollars a pop when I visit the lovely Shannons to attend to matters of personal grooming. 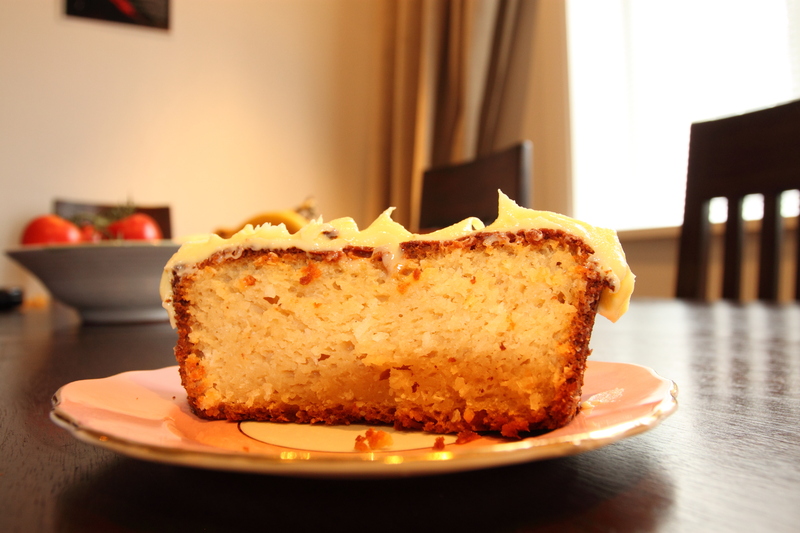 I’m never at a loss for what to do with a lime and with a whole bag in hand, my thoughts turned to this delicious orange and almond cake that my lovely sister brought along for a lunch visit a few years ago. 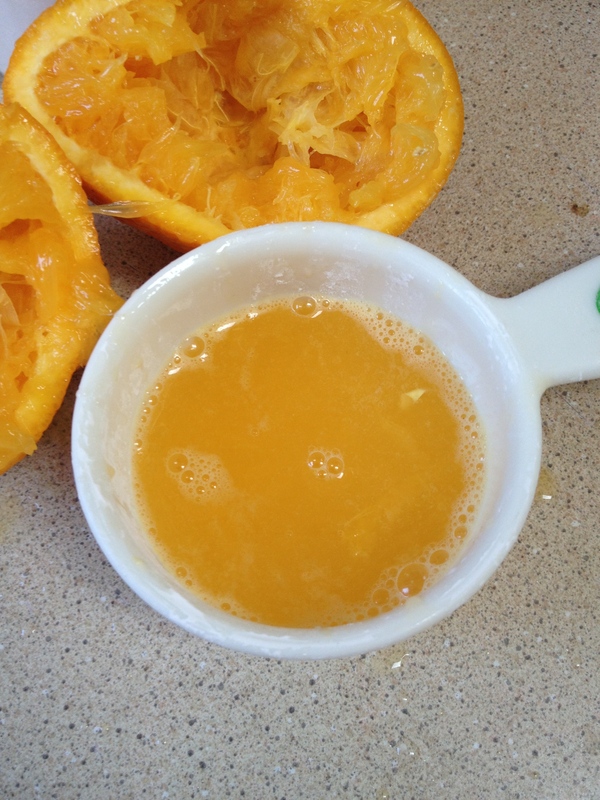 Curiously, I learned, the orange is boiled to provide a flavoursome, moist base. It may feel sacrosanct to boil a precious lime, but with a whole bag, I was feeling reckless. Having never considered the possibility of boiling fruit for the purposes of cake before, my imagination was on fire. A little polenta to the recipe, inspired by Nigella’s lemon polenta cake recipe, gives this cake a lovely texture and just the right amount of chew to the crust. I enjoy the tanginess of the limes, but for the more faint-hearted, include a little extra sugar if you like a touch more sweetness. 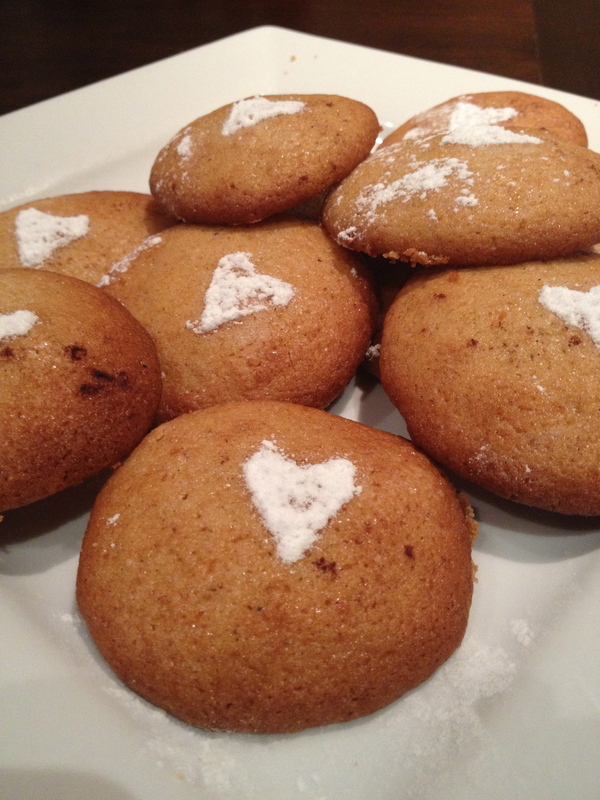 And, if you make sure to use gluten-free baking powder, this even ticks the gluten-free box. Butter and line a 21cm springform tin. Put the limes in a saucepan, cover them with cold water and pop them on the stove. Bring to the boil and boil for an hour. Drain the limes, watching for your fingers as they will still be a little hot. Chop the limes into bits and pick out any seeds. Use a blender or masher to puree the limes, skins and all, until smooth. Set this aside. In a largish bowl, beat the eggs and sugar until they are thick and pale. 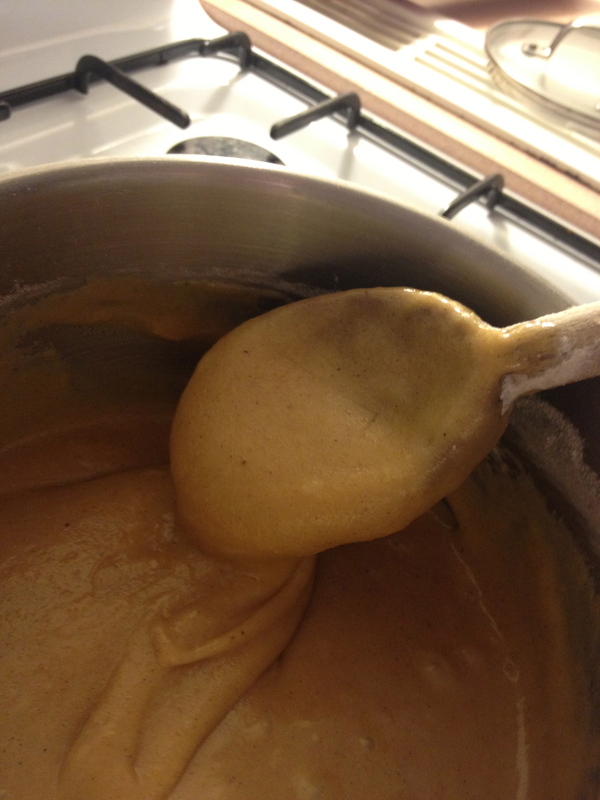 Add the pureed limes, ground almonds, polenta and baking powder to the egg and sugar mixture. Gently fold in until everything is just combined. Pour the mix into the prepared cake tin. Bake in a 180 degrees celsius oven for 45 minutes, or until a skewer prodded into the centre of the cake comes out clean and the cake is just beginning to pull away from the sides of the tin. Leave the cake in its tin on a baking rack to cool before turning out. I can heartily recommend this cake warm, with a little yoghurt or vanilla ice cream on the side. This idea came to me by accident, really. I’m always a fan of shortbread, so any excuse for that. 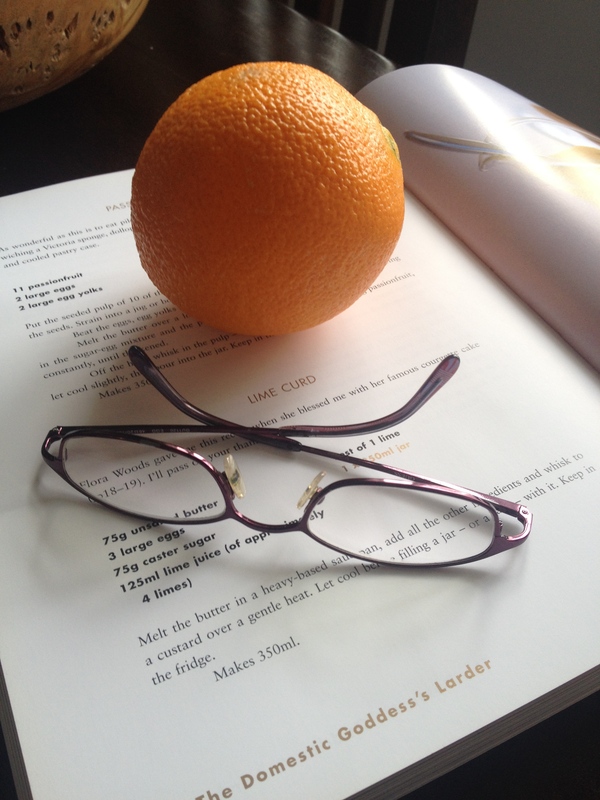 But the orange part happened when a lonely orange, languishing in the fruit bowl, happened to cross my field of vision whilst I was enjoying a Sunday morning browse through Nigella’s How to be a Domestic Goddess. I happened to spot Nigella’s cute little Lemon Gems and immediately wanted to create similar little dollops topped with something rich and citrus-y. Lacking the vegetable shortening required by the recipe, however, and not feeling much inclined to go out hunting for some, another hearty biscuit was needed. 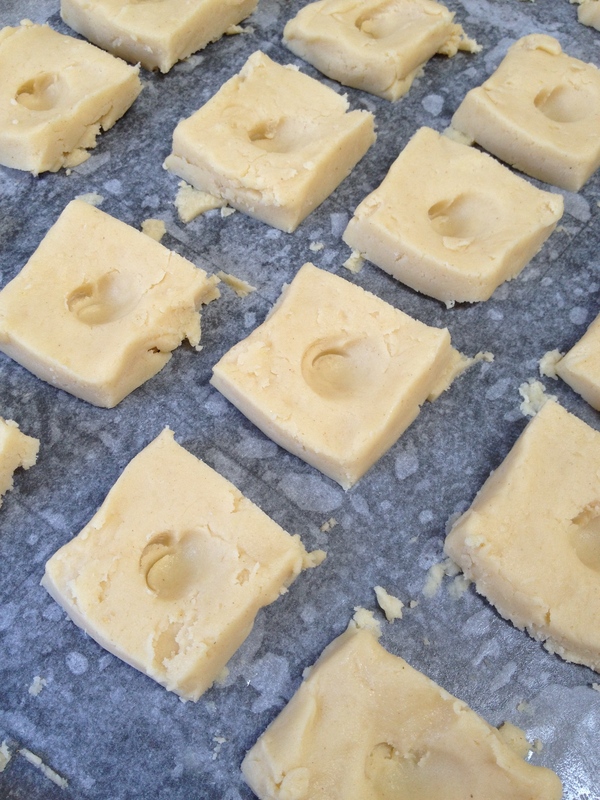 My go-to shortbread is recipe is the trusty Edmonds’ and so I very naughtily used it here…and I say naughty, as I’m using not using Edmonds as part of my Edmonds Challenge, which reminds me that I am due some more excitement with that particular endeavour. And so, I mixed things up by deviating from the recipe slightly with the addition of ginger. Cream 250g butter and 1 cup of icing sugar together until it’s light and fluffy. Sift 1 cup of cornflour and 2 cups of flour together. If you’re me, at this point also add 1.5 teaspoons of ground ginger and 1 tablespoon of grated fresh ginger to the flour and cornflour. 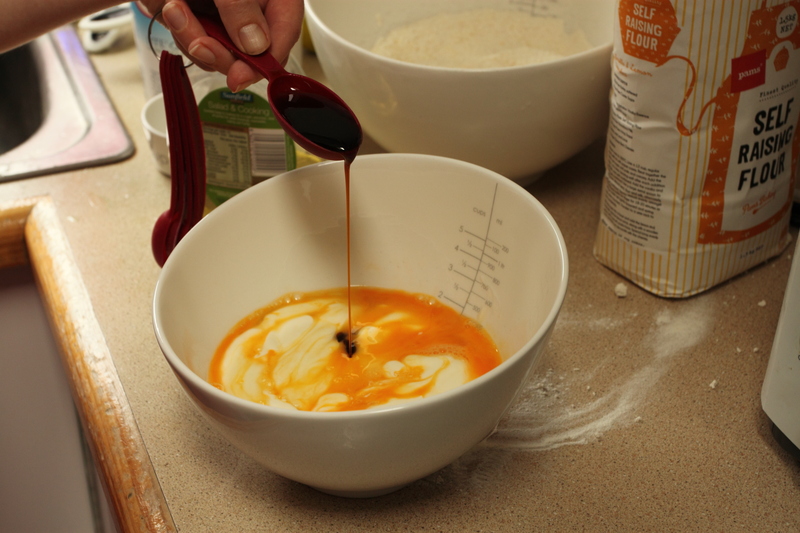 Mix the dry and creamed ingredients together, knead and roll out to 0.5cm thickness on a floured board. 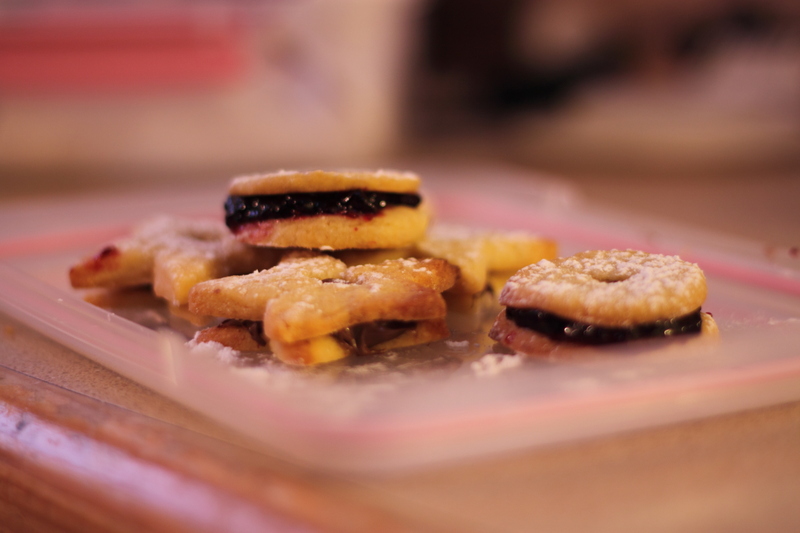 At this point, I transferred the shortbread to an oven tray and it into rectangles. I used a (clean!) 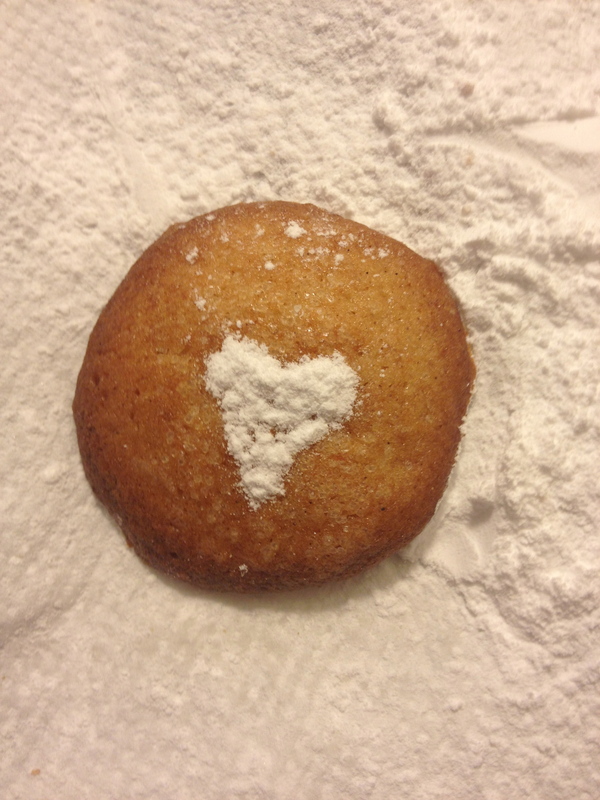 fingertip to make little craters in the biscuit and popped them into a 150 degree celsius oven. And now for the curd. Seeing as I was having a Nigella day anyway, I used her recipe for lime curd, replacing the lime juice and zest with the juice and zest of my orange, along with a quick squeeze of lemon juice. 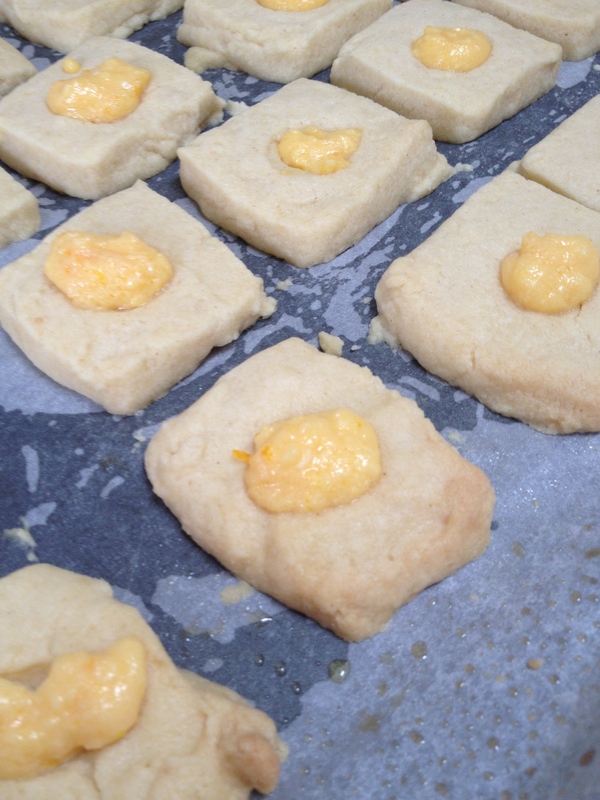 When my indented shortbread had become pale golden (which took about half an hour) I removed it from the oven and filled the little craters with the orange curd. It was a creamy, custardy curd which was rather pleasant with the shortbread. And the whole lot went at work the next day, so they can’t be all bad. Lucky me, to receive this lovely baking book for my birthday from my similarly kitchen-obsessed little sister. Alice Arndell’s Alice in Bakingland is a treat for the eyes as much as anything, full of pictures of dainty plates, matching teacup-and-saucer sets, all showing off delightful mounds of delicious cakes and biscuits. Squeal! 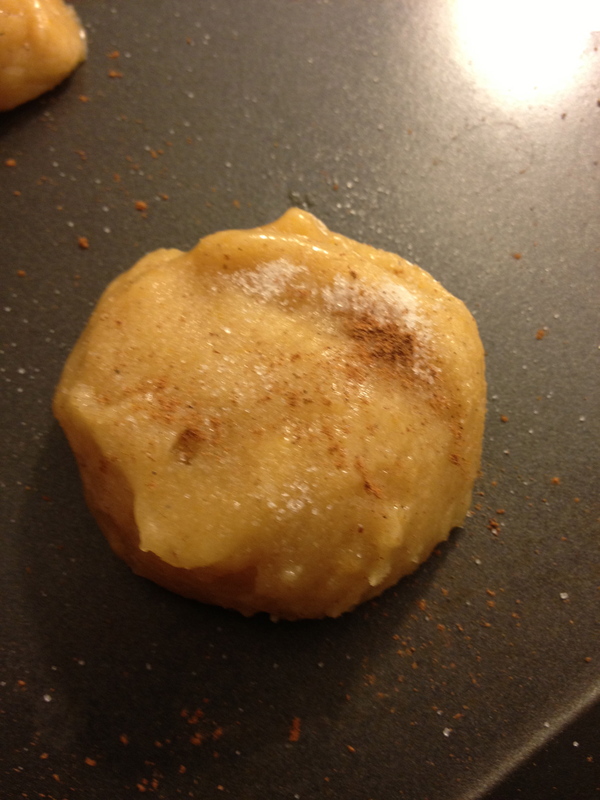 So of course it was absolutely necessary that I set about testing some of these recipes as a matter of priority. 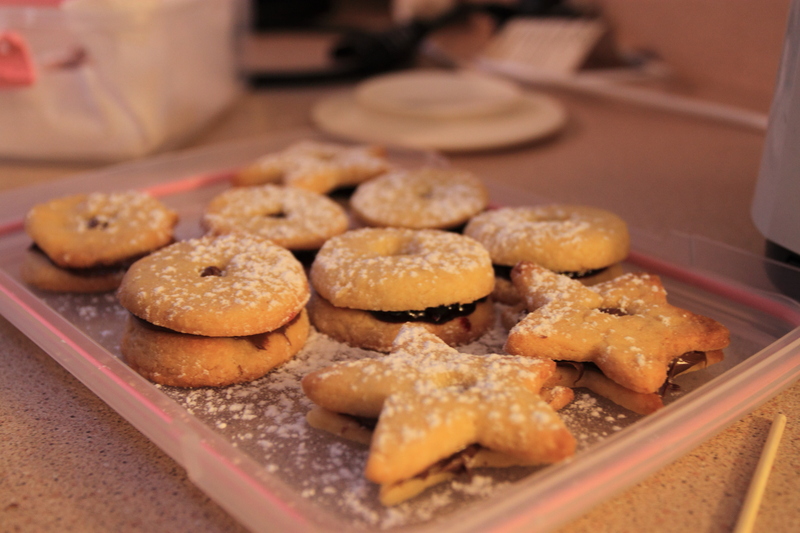 These Raspberry Rings happen to be the very first recipe of the book. Yes, I was only one recipe in when I came across my first ‘must bake.’ I prefer to think this says more about the calibre of the recipes and less about just plain greediness on my part. 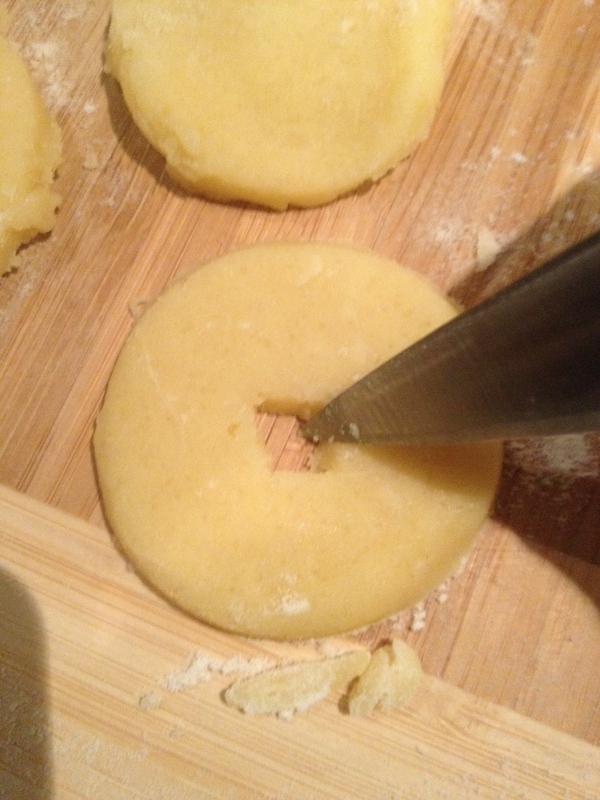 To make Alice’s lovely Raspberry Rings, I started by creaming together 200g softened butter and half a cup of sugar, then beating in 4 tablespoons of condensed milk, as directed. 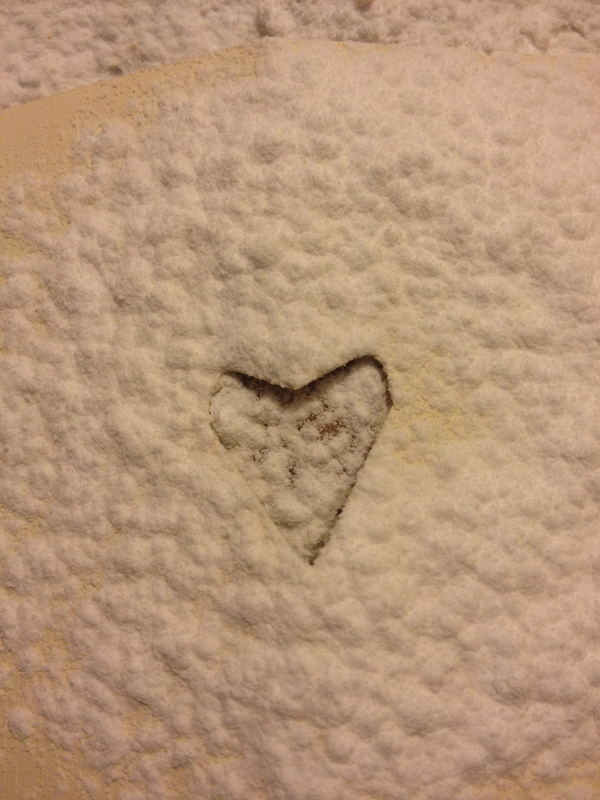 Readers of my blog may be aware of my love of creamed butter and sugar. Condensed milk does nothing to dampen the flame. After half an hour in the chiller, one disc of dough is rolled out onto a very well floured board. And can I stress here the importance of lots of flour from my personal experience…it’s always a little upsetting to pick one’s hard-earned dough from the roller. Alice directs that the dough is rolled out to 4mm thickness, and 5mm rounds are cut from the dough. I have a lovely star-shaped cookie cutter that I simply don’t get to use enough, so I decided to do some star-shaped biscuits as well. Now the surgical precision really begins….the next step is to cut little shapes from the centre of these rounds (and stars, in my case). I recommend a good sharp knife for this. 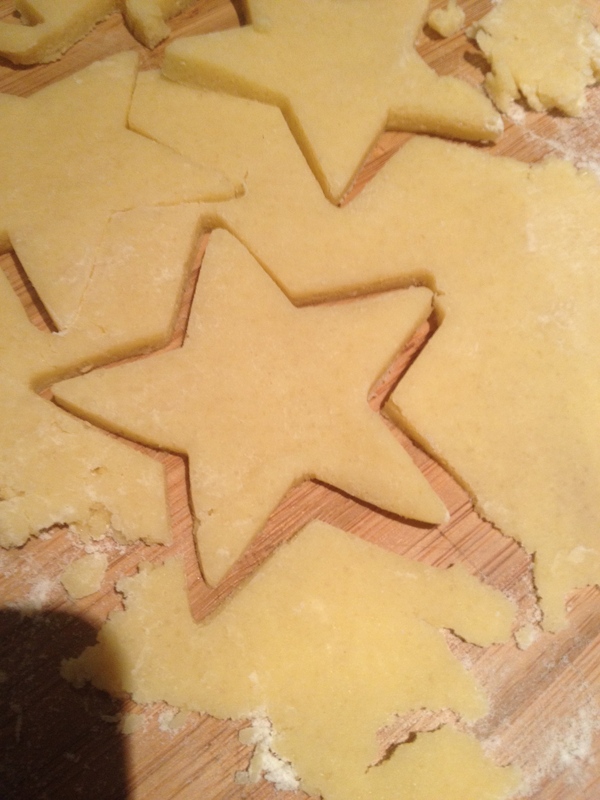 The second disc of dough becomes the bottom layer of the biscuits, so I made a second set of rounds and stars. The biscuits are baked at 190 degrees celsius until just going brown around the edges – this took about 10 minutes in my oven. 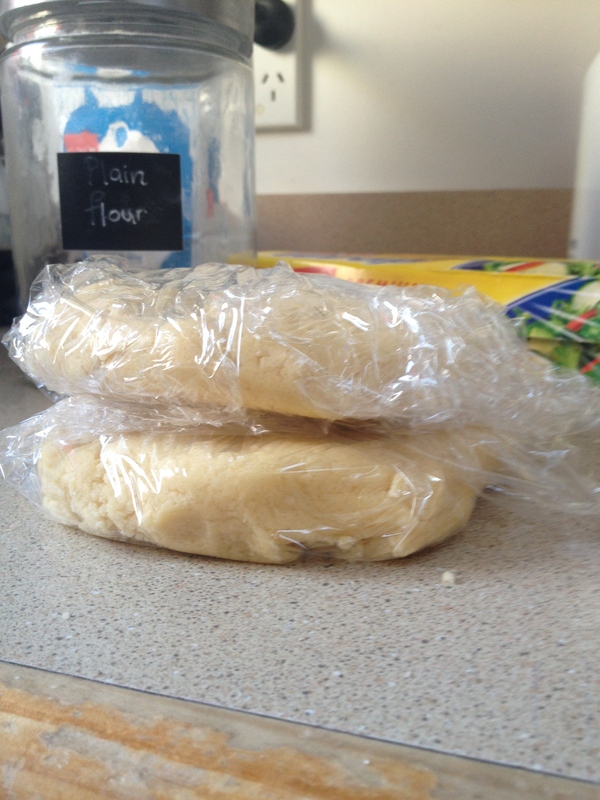 Once cool, it’s time to sandwich the biscuits. Alice’s recipe asks for a teaspoon of jam, and I used mixed berry for about half of mine. For the other half, I had a brainwave…Nutella. 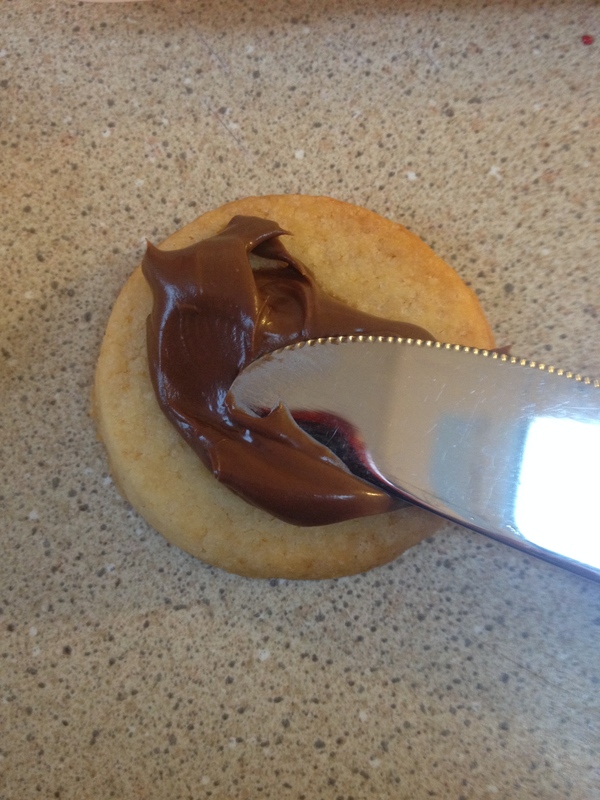 This delightful chocolate and nut spread billed as some kind of health breakfast condiment is usually something I eat from the jar with a spoon, so the step to delicious chocolately cement for biscuits wasn’t too difficult at all. 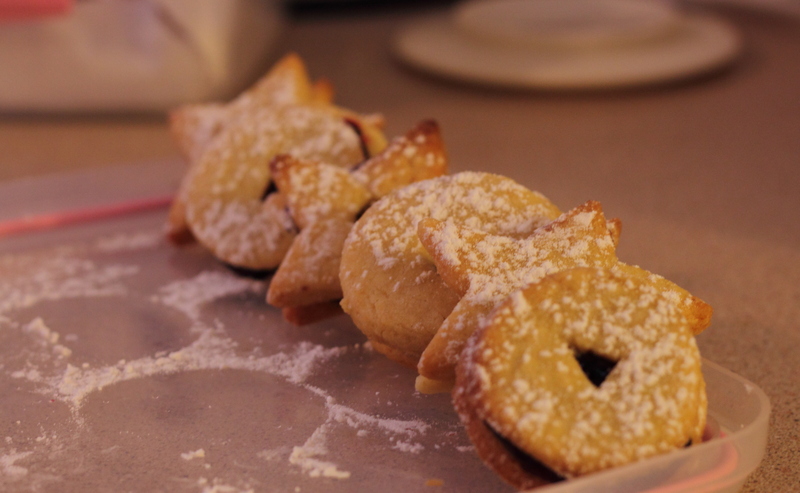 A gentle dusting with icing sugar and they are ready to go. The verdict? Both pretty and scrumptious. I can’t wait to try some more from this book. Regular readers of this blog may have noticed that I am fortunate to have parentals who kindly bring me ingredients from their travels, with which I can then experiment. And so today, I’m going to tell you all about my fun with a bottle of coconut syrup, which I understand comes from this shop in Dunedin (although originally hailing from the warmer climes of Bali). The label informs me that this product is ‘the maple syrup of the tropics’ and is made from the ‘sweet, energised water produced by living coconut trees.’ I don’t know exactly what it takes for water to be energised, but perhaps this explains the current craze for coconut water. The label also instructs me to ‘get ready for a sensational eating experience most people can only dream of.’ This is a bold claim. My friend the internet did not yield a great deal of recipes including coconut syrup, so I was on my own on this one. I settled on the idea of a coconut loaf , comforting, tasty, and most importantly, probably agreeable enough to coconut syrup. I have more or less shamelessly cribbed my recipe from this one, electing to include my syrup in place of the rum. Not that I have anything against rum, but the only spirit currently in my house is gin, and I don’t think gin and coconut loaf would have a lot going for it. And now, it was time for the coconut syrup. I wrenched off the lid and it was a tense moment – would it deliver the promised taste sensation that others can only dream of? Well dear reader, it is intensely sweet, thick, a lovely rich dark brown colour, and not at all unpleasant. But I think I am still waiting for a taste sensation of the promised magnitude. 1 tablespoon of coconut syrup. 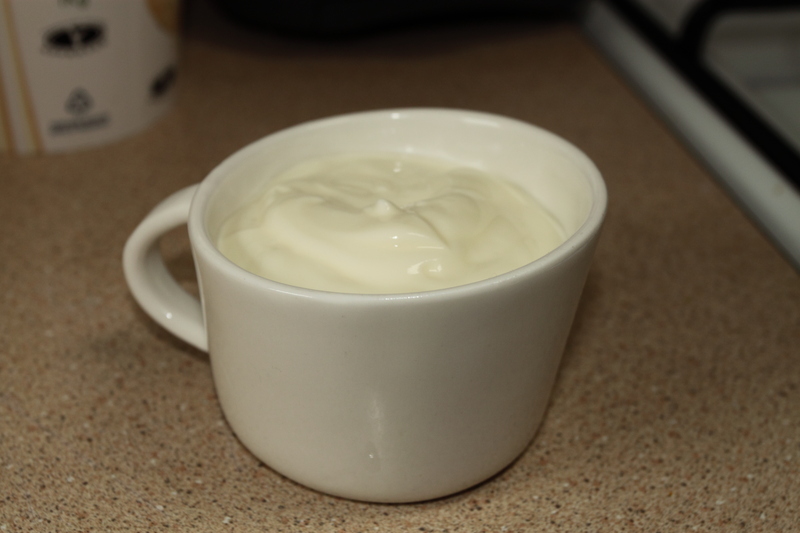 I folded the yoghurt mixture into the dry ingredients until blended and scraped it into the greased, lined tin. I baked the loaf until a skewer inserted into the middle came out clean, which took one hour ten minutes in my oven, and I covered the top of the loaf with foil to prevent burning for the last ten minutes. I decided this cake would do well with some icing, mainly because I really, really love icing. I made a lime icing by mixing together icing sugar, butter, a little hot water and the juice of the lime, which I slathered over the loaf when cool. The verdict? This recipe makes a moist, substantial loaf which leaves you feeling satisfied that you are getting something hearty and filling. Full credit to the original recipe for providing such a simple method yielding such a lovely loaf. I must confess however, that I am not convinced the coconut syrup added a huge amount to the process. 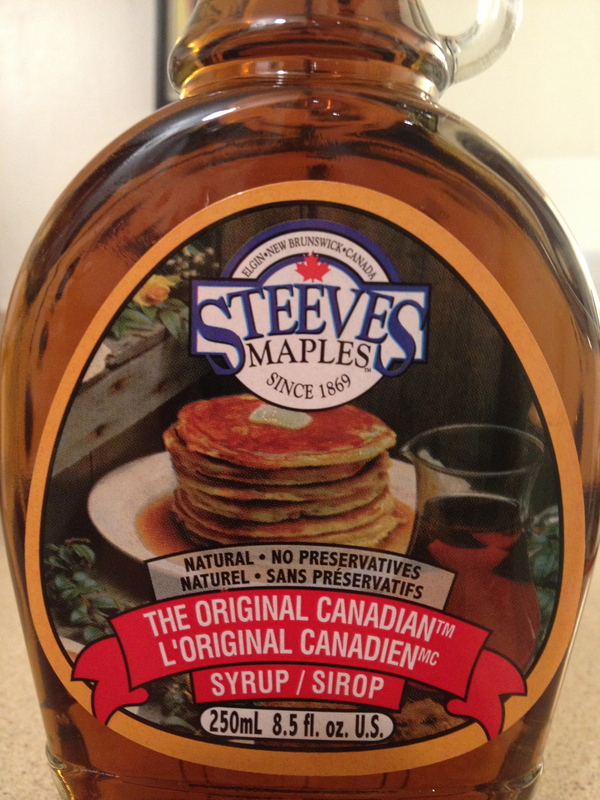 The label does include the suggestion that one may like to try it on ice cream or pancakes, and I do think it would be most pleasing in this form, even if my baking with it is not about to take the world by storm. Take care readers, and do alert me should any coconut syrup deliver you the taste sensation previously only dreamt of in coming days.